An artist's illustration of China's Queqiao relay satellite, which will relay data between controllers on Earth and China's Chang'e 4 lander-rover pair on the moon's far side. 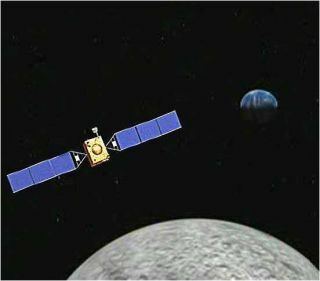 Queqiao is scheduled to launch on May 20, 2018; the Chang'e 4 duo will lift off in November or December. China will launch the next piece of its ambitious robotic lunar-exploration program on Sunday (May 20), if all goes according to plan. The nation's Queqiao relay satellite is scheduled to lift off atop a Long March 4C rocket on Sunday from the Xichang Satellite Launch Center in Sichuan Province at about 5 p.m. EDT (2100 GMT; 5 a.m. on May 21 local Xichang time). The moon is tidally locked to Earth, meaning it always shows the same face (the near side) to our planet. So, a relay link is necessary to communicate with spacecraft on the far side, which would otherwise have to send their signals through the moon's rocky bulk. Queqiao will also carry an astronomy experiment called the Netherlands-China Low-Frequency Explorer, which will search for radio signals from the universe's very early days and characterize the solar wind near the moon, among other work. And Queqiao won't launch alone; the Long March 4C will also loft two small satellites called Longjiang-1 and Longjiang-2, which will perform radio-astronomy research of their own. The Chang'e program has already achieved a string of successes. The Chang'e 1 and Chang'e 2 probes reached lunar orbit in 2007 and 2010, respectively, and the Chang'e 3 mission put a lander and rover on the moon's near side in late 2013. The next year, China launched Chang'e 5 T1, a mission that sent a sample-return capsule around the moon and back to Earth to demonstrate the technology needed to survive a fiery atmospheric entry. China plans to launch a bona-fide lunar sample-return mission, called Chang'e 5, in 2019. The nation also aims to put people on the lunar surface before the end of the 2030s, Chinese officials have said. The Chang'e program was named after the Chinese goddess of the moon, and "Queqiao" means "bridge of magpies." This latter moniker comes from a Chinese folktale. In the story, as China's state-run Xinhua news service explained last month, "magpies form a bridge with their wings on the seventh night of the seventh month of the lunar calendar to enable Zhi Nu, the seventh daughter of the Goddess of Heaven, to cross and meet her beloved husband, separated from her by the Milky Way." "Longjiang," by the way, means "dragon river." This is apparently a nod to the small satellites' home base; they were developed by the Harbin Institute of Technology, which is located in Heilongjiang Province. "Heilongjiang" means "black dragon river"; it's the Chinese name for the big, powerful river that Russians call the Amur, which forms part of the border between Russia and China.